Are you an incurable writer? Here are 56 tell-tale clues! This is the fifth in a series of self-help tests to diagnose you as an incurable writer, hopelessly addicted to words and a vagabond spirit upon this planet. Read here the fourth 52 signs that you might be a writer. Are you an incurable writer? If the collection of notebooks beside your bed obscures your alarm clock, you might be a writer. If you love visiting cities like Washington, DC, and Brooklyn, because they have streets named for letters, you might be a writer. If the most aggressive argument you had last week was with one of the characters in your head, you might be a writer. 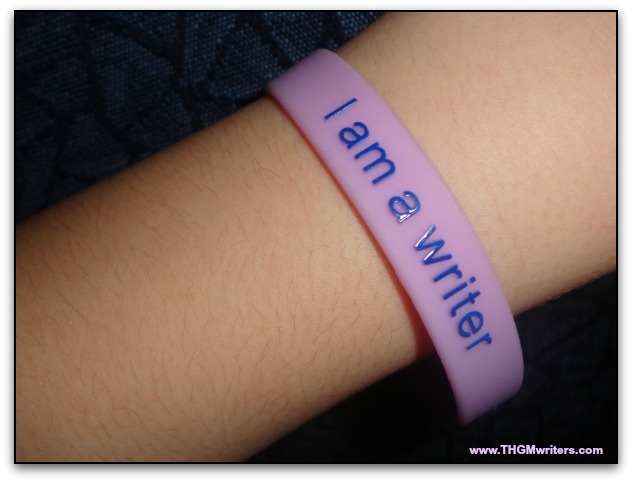 If you have a wristband that says, “I’m a writer”, you might be a writer. If you refer to your mentor as your “muse”, you might be a writer. If a full parking lot is a sign that a restaurant is probably serving a lot of “characters” right now, you might be a writer. If the most common question you get when you run into someone at the grocery store is “Where have you been?”, you might be a writer. If you measure speed in pages per hour, rather than in miles per hour, you might be a writer. If you still save a place at the table for your imaginary friend, you might be a writer. If you consider eating and sleeping to be distractions, you might be a writer. If you think that a pen or pencil is one of the “Six Simple Machines“, you might be a writer. If your notebook follows you even into the shower and the swimming pool, you might be a writer. If the draft at your desk comes from neither the door or the window, you might be a writer. If when someone says they have to buy new sheets, you think they are talking about paper, you might be a writer. If you arrange your jars of jams and sauces and condiments and pickles in alphabetical order, you might be a writer. If your pillow is better educated than most people you know, you might be a writer. 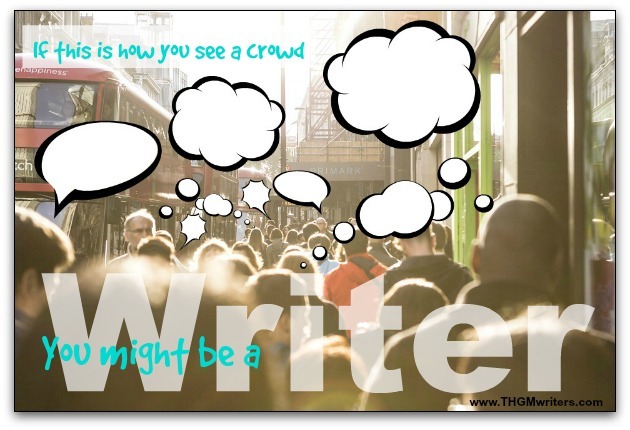 If everybody in a crowd appears to have a thought bubble above their heads, you might be a writer. If the death of one of your barn cats inspires a whodunnit, you might be a writer. If cars behind you always honk while you try to read every sign, you might be a writer. If the subject you excelled in best at school was daydreaming, you might be a writer. If you know there must be a desk somewhere under all those notes, you might be a writer. If you feel gypped when your new screwdriver doesn’t come with a users manual to read, you might be a writer. If there is a tattoo of a pen on your arm, you might be a writer. If furniture assembly instructions usually compel you to send the manufacturer a “letter to the editor”, you might be a writer. If you have ever stockpiled books in anticipation of a possible shortage, you might be a writer. If you consider run-on sentences to be human rights violations, you might be a writer. If you read a newspaper story about a war and remember the horror of the grammar mistakes rather than the horror of the killing, you might be a writer. If you have ever insisted that there is no life on Mars because no Martian publisher has been discovered, you might be a writer. If you hold a secret grudge against pictograms, you might be a writer. If you think that “writer’s block” is a term for the cornerstone of your story, you might be a writer. If you often have difficulty answering questions because it’s not that simple to choose the right words, you might be a writer. If the most beautiful wrapping paper you can find in the house is a newspaper, you might be a writer. If you choose where to shop for a new home based on “proximity to fire hydrant”, you might be a writer. 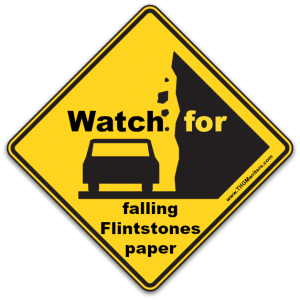 If you know that “Flintstones paper” is a synonym for rocks, you might be a writer. If you have ever been confounded by the lack of an official word for “doughnut holes”, you might be a writer. If you are always the last to finish your dinner because nobody else in the family keeps getting up to check facts that come up in conversation, you might be a writer. If the tips of your fingers are callused, you might be a writer. Or a guitarist. Or, most likely, both. If you can’t understand why anybody would turn on the TV when there is a perfectly good book still unwritten, you might be a writer. If you still write Christmas cards, because…well…it is writing, after all, you might be a writer. If your paper recycling exceeds your compost nine times out of ten, you might be a writer. If you take up an offer for a “free quote” assuming they’ll be quoting from literature, you might be a writer. If your pillow is feeling lumpy from all the notebooks beneath it, you might be a writer. If all the patches on your quilts have letters, you might be a writer. If the periodic table sounds exciting because it’s dedicated to a punctuation mark, you might be a writer. If you’ve ever donated a box of assorted bookmarks to charity, you might be a writer. If your spouse mentions “romance”, and you think “Harlequin”, you might be a writer (in the doghouse). 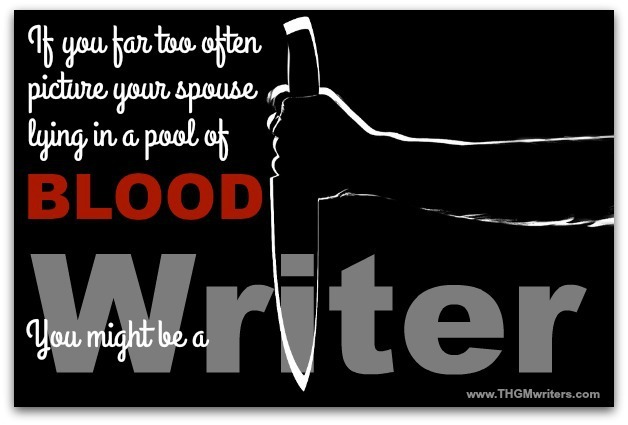 If you far too frequently picture your spouse lying on the floor in a pool of blood, you might be a writer. If you check for dead bodies before putting anything in the dumpster, you might be a writer. If each item on your shopping list requires foreshadowing, you might be a writer. If you prefer reading to travel because books take you more places, you might be a writer. If you think plagiarism should be added to the Criminal Code, you might be a writer. If you’ve ever considered publishing your grocery list, you might be a writer. If you know when to use a comma, or even if you think you do, you might be a writer. If you actually cheered when Twitter hinted at an increase from 140 characters to 10,000 characters, you might be a writer. If your allergy profile at the pharmacy includes split infinitives and BLOCK CAPS (sorry), you might be a writer. Now it’s your turn. How do you recognize a writer? What are the tell-tale clues that warn you to defenestrate while there’s still breath in your body? But who wants to be cured, right? This is a great post – fun to read but with some really good points too. Thanks to Sheryl Perry for sharing.